grocery pipeline to give away Operator's product. 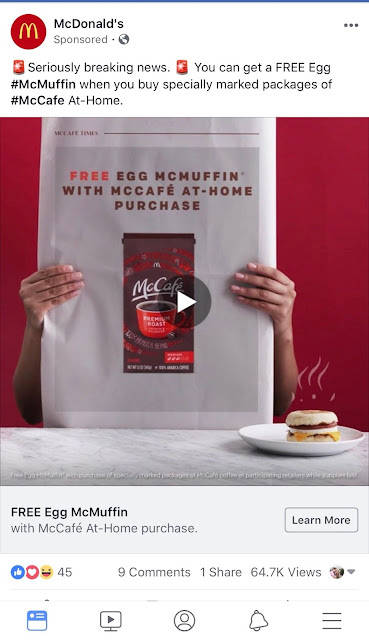 It wasn't just Operator ad dollars that built the McCafe brand, it was Operator personal dollars to build in the McCafe in the restaurants and then replacing espresso equipment. And we can't charge more than $1 for a coffee or $2 for the new espresso drinks from the new expensive machine we were forced to buy. MCD doesn't cap the price of McCafe products in the grocery stores. They get to make money and we don't. In 2013 or 2014, I was one of only two operators at our Co-Op meeting to argue against McCafe to be sold in grocery stores. No one else really cared at the time or had the courage to fight this. You reap what you sew! We get Screwed By our OPNAD & NLC reps again and again. I can understand losing to McD Leadership since they are our Franchisor and it is big business. But our own Reps continuously spit in our Face and we are suppose to like it. I want to be able to vote for our National Leaders, some of these Jokers have been moving from one National Leadership position to another and back again for over 20 years. Don’t they have restaurants to run? This is absolutely ridiculous. Many OPNAD & NLC reps do not run restaurants they are passive owners, many are ex-McDonald's employees and if they are not they usually hire an ex-McDonald's executive to operate their restaurants. They look to grow their overall business and portfolio they are not emotionally attached to a restaurant or have a sense a pride in each restaurant, it is just a business acquisition that operates and sells burgers. They are on message at every meeting with the corporate script and say they represent the franchisees' overall interest but they do not they are there to drive the corporate message home to their regions. If they do this well they will be rewarded with assets to add to their portfolio of restaurants. There is no accountability for what they promote, vote for or endorse.